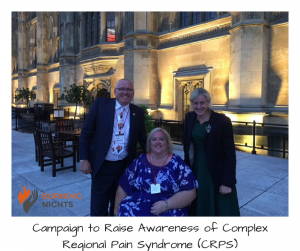 After working with the charity’s local MP since January 2018, on 19th June 2018 Burning Nights CRPS Support’s MP, Ruth George MP (High Peak) raised a 40 minute Adjournment Debate on Complex Regional Pain Syndrome (CRPS). This was just a part of our campaign to raise awareness of Complex Regional Pain Syndrome (CRPS). First of all we would like to give our thanks to Ruth and her staff for all her hard work in not only getting this Adjournment Debate in Parliament but for also supporting the charity in one of its main objectives; raising awareness of Complex Regional Pan Syndrome (CRPS). Since the beginning of January 2018 Ruth George MP, has been asking a number of pertinent questions to the Secretary of State for Health regarding Complex Regional Pain Syndrome such as exactly how many patients are diagnosed with CRPS in the U.K., how many hours of training do each health professional do in chronic pain and CRPS and many others. All of which received very unsatisfactory or vague answers. This was one of the main reasons Ruth decided to request an Adjournment Debate on CRPS in Parliament. 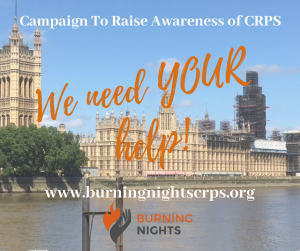 In Ruth’s speech at the CRPS Adjournment Debate in Westminster, she gave a brief account of one of her constituents who is a CRPS patient and a bilateral above knee amputee due to Complex Regional Pain Syndrome and who is also the Founder and Chair of Burning Nights CRPS Support charity. Ruth talked about the condition itself and gave a vivid account of how it feels to patients as well as the numerous problems that CRPS sufferers face including not being believed by health professionals, being questioned as to whether it was in your head, health professionals not knowing what the condition is or not being able to recognise the signs and symptoms of CRPS, length of waiting times to get into a Pain clinic and more. A couple of other MPs also supported Ruth in the vivid description of CRPS she was giving. Since the MPs Drop In session on Wednesday 28th November 2018, Ruth George MP has now tabled an Early Day Motion for CRPS that we’d like to get as many MPs as possible to sign. An Early Day Motion or EDM is a formal proposal that is submitted to the House to have a formal debate on Complex Regional Pain Syndrome (CRPS) at the earliest opportunity. However we need more MPs to sign this EDM. Please ask your local MP to sign the EDM via this EDM LINK. Currently the U.K. Government do not hold statistics on the number of people diagnosed with Complex Regional Pain Syndrome (CRPS), surely this should be a statistic that is kept? The statistics that are generally used are that there are 26.2 per 100,000 patients with CRPS or 1 in 3,800 equating to 15,000 patients with CRPS in the UK. There is also no ICD10 coding tick box for CRPS, so when people are diagnosed with CRPS, the health professionals cannot simply tick a box to say you have CRPS, so data can be collected by the NHS. The U.K. has recognised CRPS for well over 150 years even though the first description of the condition was the mid-16th Century. Therefore surely by now there should be these statistics collected by the NHS? The NHS currently have CRPS guidelines written by the Royal College of Physicians which have just been updated as of 23 July 2018 (RCP Updated 2018 CRPS Guidelines). This gives a pathway from diagnosis to treatment. Unfortunately because many of the health professionals you go to don’t know what CRPS is, they won’t know that these guidelines exist. However there are no current emergency medicine guideline or pathway for A & E, walk in centres, fracture clinics etc, so when you are first injured and go to A & E or a walk in clinic the healthcare professional isn’t looking for CRPS. In Liverpool and Cork they actively look for CRPS especially in their Fracture Clinic using a certain pathway. This is what is needed around the U.K.
Providing mental health support for CRPS sufferers, with a 24-hour helpline—the pain is particularly excruciating at night—to help them to get through without feeling that they have to resort to amputation or even suicide. The final of Ruth’s requests was that the Minister of State (Department of Health and Social Care), Caroline Dinenage (Gosport), meet with Burning Nights CRPS Support charity’s Founder, CRPS patient & Ruth’s constituent, Victoria, which the Minister did do. On behalf of the charity we’d like to thank the Minister for speaking with Victoria. In response to Ruth’s Adjournment Debate on CRPS, the Minister of State (Department of Health and Social Care, Caroline Dinenage advised the House that there were RCP Guidelines in place for CRPS as well as NICE guidelines for the pharmacological treatment of neuropathic pain which included Complex Regional Pain Syndrome (CRPS). The Minister also explained that the NHS Choices website did provide information about the condition. The Minister also mentioned that from the time of a GP referral for a Pain Clinic appointment, the waiting time is 13 weeks. How long did you wait to see the Pain Clinic after you were referred to the Pain Clinic? Please let us know how long you waited from when your GP referred you to a pain clinic to your appointment. As we mentioned above, one of Ruth’s requests were for a 24 hour helpline, we would like to let you know that one of Burning Nights CRPS Support’s main frontline services is a telephone helpline. At the moment the helpline has restricted times however we hope that in the future to be able to open this service further to run 24 hours, 7 days a week. If you would like to contact us for help, information or support, our helpline number is 01663 795055 or you can contact us by email if you would prefer. We’d like to reassure you that all the information contained on our website is up to date and has all been gained from research studies available at the time. We are registered as a CRPS provider organisation on NHS Choices as well as the British Pain Society. If you’d like to read the actual Adjournment Debate on CRPS please visit the Hansard link to the Adjournment Debate on Complex Regional Pain Syndrome [ ] If you would prefer to watch the Adjournment Debate on CRPS raised by Ruth George MP, you can watch it via the U.K. Parliament TV begin watching at 19.15.35 pm until the end which is 19.39.35 pm. 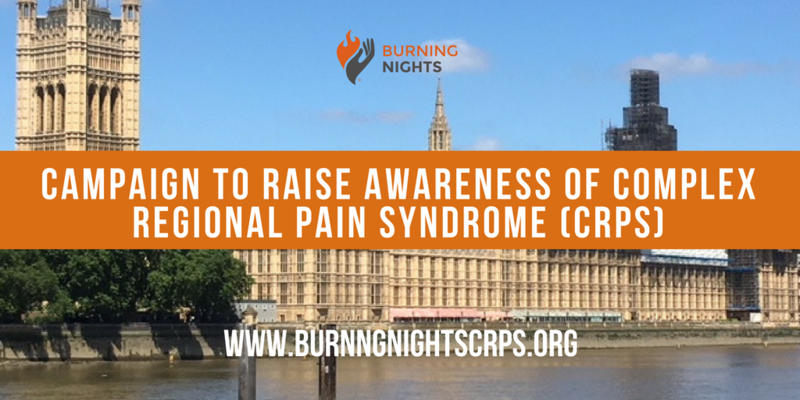 Campaign to Raise Awareness of Complex Regional Pain Syndrome (CRPS) – We now need YOUR help! 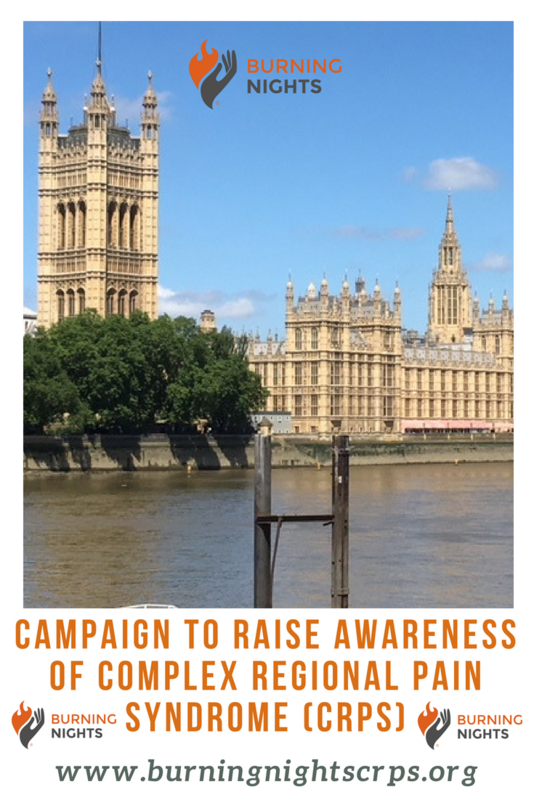 We would like you to get in contact with your local MP, MEP, MSP or AM and let them know that you are supporting the campaign to raise awareness of Complex Regional Pain Syndrome (CRPS). The more MPs that are aware that they have a constituent with CRPS, the more weight will be added further down the political line and getting the proper recognition that CRPS deserves. You don’t have to be a CRPS patient to get in touch with your MP to support our campaign. You may be someone who cares for a CRPS patient, or a family member has CRPS or your partner has CRPS or you have a friend with CRPS. 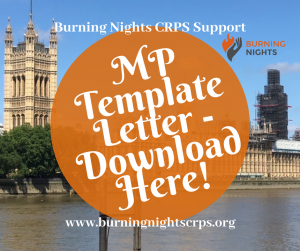 -> To help you with this letter we have written a template letter – MP Letter To Support The Campaign to Raise Awareness of CRPS – that you are free to use and adapt to suit you if you’d like. OR download the letter in PDF via the image below: We need as many MPs, AMs and MSPs aware of Complex Regional Pain Syndrome (CRPS) and of the 4 requests that Ruth George MP made in the House at her Adjournment Debate, because it is only then that things can change. To find who your MP is and their constituency address please visit the Parliament website. If you do contact your MP please do let us know so we can forward their name and constituency to Ruth and her staff. UPDATE – On Wednesday 28th November 2018 at 10 am-12 noon there was a Parliamentary Drop-in event for Complex Regional Pain Syndrome (CRPS). A good number of MPs did turn up to support their constituents, however we still need more MPs support. We’re now asking MPs to sign the Early Day Motion for CRPS that has already been tabled. Please contact your local MP/MEP/AM/MSP and tell their your story and include the Early Day Motion link. You can find your MPs contact details via the Parliament UK link. What Else Can You Do To Support This Campaign To Raise Awareness of CRPS in Westminster? Crps suffers need all the help they can get. My 15 yr old granddaughter is a sufferer and little help is available when needed. School attendance is very difficult as the pain is worse when sitting down for any length of time at a school desk. More help is needed for these crps suffers and families urgently. The pain we see our granddaughter go through at times is heartbreaking.